The Eden Raised Garden Table by Riverstone (RGT-34) is the Ideal Vegetable & Herb Growing system. The unit blends into all environments nicely and can be stained or painted to match any exterior setting including your porch or deck. The elevated growing surface and covering system allow it to accomplish things a standard garden cannot, similar to a greenhouse. The soil can be weed free, with no slugs or snails, grubs or weeds with no need for chemical fertilizers or pesticides. A great feature is gardening while sitting on a stool or bench. The OPTIONAL UV protected covering (RGT-T34) with protective mesh netting to keep insects and rodent out, trap the sun's warmth while allowing air to flow within the garden. This is a great option for your garden which will extend your growing season as well as protect your crops from too much rain, wind, pets and any other animal roaming nearby. 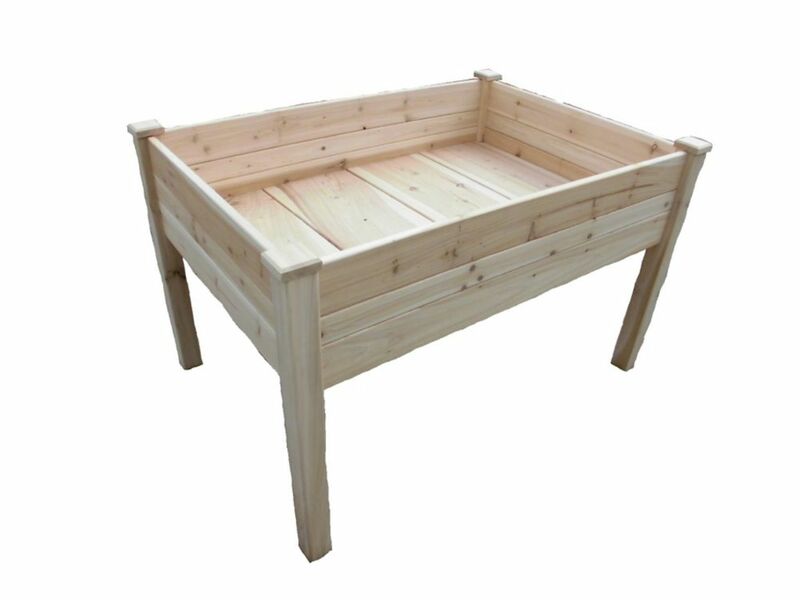 With multiple sizes you are sure to find an Eden Greenhouse and Herb Garden to meet your needs. Raised Garden Table (Large) The Eden Raised Garden Table by Riverstone (RGT-34) is the Ideal Vegetable & Herb Growing system. The unit blends into all environments nicely and can be stained or painted to match any exterior setting including your porch or deck. The elevated growing surface and covering system allow it to accomplish things a standard garden cannot, similar to a greenhouse. The soil can be weed free, with no slugs or snails, grubs or weeds with no need for chemical fertilizers or pesticides. A great feature is gardening while sitting on a stool or bench. The OPTIONAL UV protected covering (RGT-T34) with protective mesh netting to keep insects and rodent out, trap the sun's warmth while allowing air to flow within the garden. This is a great option for your garden which will extend your growing season as well as protect your crops from too much rain, wind, pets and any other animal roaming nearby. With multiple sizes you are sure to find an Eden Greenhouse and Herb Garden to meet your needs. Raised Garden Table (Large) is rated 3.0 out of 5 by 5. Rated 5 out of 5 by SkaterGuy from Easy to Assemble. Product looks like the pictures. The wood slides into itself in pre-cut groov... Easy to Assemble. Product looks like the pictures. The wood slides into itself in pre-cut grooves. Some of them are a little tight but if you put some soap in the groove it goes right in. Very nice and sturdy end product. Worth it. Rated 2 out of 5 by 719 from We had to order the stain to protect it. ... We had to order the stain to protect it. At this price that should have been on the product!!!!! Rated 2 out of 5 by FarmerPhil from The garden tables were easy to put together, no tools... The garden tables were easy to put together, no tools needed. I purchased two tables. My problem was one leg had a crack in it and one plank of wood was cracked. Rated 1 out of 5 by jim from I was really excited to get this raised garden, but was very disappointed in construction. Pieces... I was really excited to get this raised garden, but was very disappointed in construction. Pieces are all cut to slide together with a dovetail joint, but no two pieces actually fit together. Literally. I probably could have tried taking every single dovetail and sanding them down until they fit, but if I wanted to do carpentry, I would have built it myself in the first place. I'm going to try another brand and hopefully get better results.